Luxury Villa With Heated Pool. Up To 10 People. Villa in the centre of Arrabida’s natural park. QUINTA DE SANTO ANTÓNIO is a holiday home that has been welcoming guest since 1997. Recent renovation occurred in 2013. Immersed in Arrábida’s Natural Park; the calm, secluded and relaxing natural atmosphere and breath taking views of QUINTA DE SANTO ANTÓNIO, make it the ideal place to retreat to and recharge. Poolside family moments followed by a glass of wine on the terrace at sunset; or indulging over a barbecue meal accompanied by the idyllic scenery, herbal fragrances and natural sounds; is all part of the holiday experience to which is added the comfort of a first class luxury house, for your perfect vacation. Moreover, QUINTA DE SANTO ANTÓNIO’s strategic location invites guests to visit its surrounding, on a trip through the regions natural heritage and history. As guardians of the Natural Park, Setúbal with the Fortress of São Filipe, Palmela and Sesimbra with their castles and Cape Espichel with its lighthouse and Sanctuary were built on its limits. In the park’s core among other surprising elements stands a Franciscan convent built over centuries on the slope overlooking the sea, as an isolated refuge for meditation. QUINTA DE SANTO ANTÓNIO’s location in a coastal region gives easy access to a large variety of beaches. All from long stretches of golden sand and calm sea to rocky beaches and impressive waves for surfing. Furthermore Arrábida’s conditions excel for paragliding, scuba diving and hiking, making them popular activities. The region’s fertility makes for great agriculture and cattle breeding. Resulting in high quality regional products as cheeses and wines. Lastly, taking a day off to get to know the incredible light, sights and mysteries of Lisbon, one of the world nicest cities is time well spent. With about 250m2 QUINTA DE SANTO ANTÓNIO is built on two floors, accommodating four rooms and up to 10 people with top quality comfort. - A spacious living room on the top floor, with beautiful tiled panels from the XVIIIth century and cherished décor, articulates the house. It includes a dinning and TV nook and a staggering view through a glass façade. - On the bottom floor an even larger living room with direct access to the garden and pool accommodates a sitting corner, a snooker table and a foosball table. - The well-equipped and modern kitchen, present a view of the mountains while cooking. QUINTA DE SANTO ANTÓNIO’s four rooms can host 10 guests. The rooms have been refurbished in 2013 to heighten the vacation experience starting from the comfort of the sleeping accommodations, the private space where one starts the day and retrieves at night (and for the occasional nap!). With top quality detailing, each of the rooms has its own special and distinctive character; all have a direct window to the garden allowing each of them to embody the smells and views of the surrounding. - A suite with a full private bathroom and closet area. The bed is aligned with the window and all “mess” is invisible from the bed accentuating purity and relaxation of being in bed, which in complemented by the presence of the exterior in the foreground. - A spacious double room in which the contrast between the modernity and colour of the new intervention highlight the pre-existing dark wood detailed furniture. All to enhance the comfort of laying in bed. - A double room with its bed facing the window, which opens directly onto the natural park creates an astonishing laying in bed experience. Image waking up with the gentle breeze and light entering the room and looking up to the open landscape of the natural park. You won’t want to leave! - Finnally a room that was designed to flexibly alternate between being a double room, a twin room or a two bunkbed ward. This room will make your childrens day! In addition to the suite’s full private bathroom, Quinta de Santo António has 3 other full bathrooms, relatively close to each room so that, in fact it feels as if each room has its own bathroom. The garden, is an extension of the Natural Park itself with its autochthonous vegetation and wildlife that will come and go according to the season and time of the day. Around the house and pool there are herbs, like rosemary, lavender, time and bay among others, some of which can be used for cooking. Swings have also been installed. Beside the kitchen is a fresh, naturally shaded area with a large ancient stone table and benches, served by a barbeque. 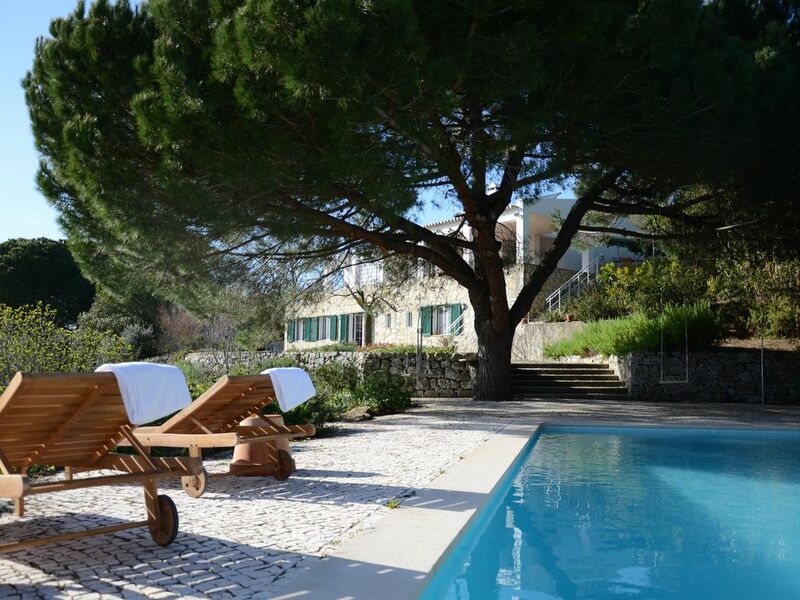 Just a few steps below lays the heated pool with its charming XVIII century fountain. This is our Quinta de Santo António - The exquisite privilege of a lifetime of clean fresh air, close to Lisbon. The house where we always dreamt of waking up; spending our days and resting at nightfall. However QUINTA DE SANTO ANTÓNIO isn’t just the house and views but rather all the visits, tour and activities its strategic location places at the disposal of our guests. It is this ability to be both a place of serenity and relaxation and the starting point of exciting tours on the discovery of the surrounding wonders that made the owner’s family fall in love with it. - have your feet in the sand or on the putting green. There are several different types of beaches in the region, from long golden sand beaches to pebbles and rocks, with calm or rough sea. Its up to you! There are 5 internationally renowned golf courses in the region. - be visiting Castles, fortresses, villas, Palaces, sanctuaries and lighthouses. - be walking on an ancient Roman road or in Roman fish salting factory. - paragliding of the top of Arrábida; scuba diving in its crystalline waters or hiking, horse ridding or cycling its numerous trails. - bird watching, fishing or dolphin seeking in the Sado estuary. All this available at your wish! - Lisbon with its magical light and monuments. - The area of Cascais-Sintra with its bucolic feel, botanical diversity and over the top romantic architecture. - The Alentejo with its gently undulating landscape and continuous meadows. Lastly, your stay at Quinta de Santo António will not be complete without indulging the sweet sin of gluttony. Besides its fish and seafood, the region is also known for being a land of great wines, cheeses and sweets. The region includes two areas of distinctive gastronomic traditions: The coastal part, dominated by fish dishes, and the interior, where you can taste the typical cuisine of Alentejo. We promise you will end your vacations fully re-established! POOL HEATING The pool heating is not included in the rental price. If desired, the same should be requested when booking and it has a value of 150 € / week. 2nd time here and we'll be back! Where should I start? We had spent a week here one year ago and loved it. Came back this year at the same period, and everything was perfect again. Easy communication with the owner(s), super-friendly welcome (thanks again Pedro), absolutely gorgeous and ultra-quiet location with total privacy and of course fantastic house. At this time of the year, the heated pool is a highly-recommended option. Needless to say, we'll be back. WE stayed in his villa for two weeks and enjoyed every minute. The spacious grounds , heated pool and well appointed dwelling were exactly what we wanted, helped by excellent weather also. Lisbon is accessible in 30-40 minutes by car/train/bus and some fantastic beaches are also within 10 minutes drive. The nearby village had all conveniences and some pleasant cafes also. David the owner was ever helpful, and we would recommend this villa for any group . Where should I start? Everything was great from the beginning to the end. The house's owners were friendly and helpful well above average and beyond expectations. The house itself is a gem, very well maintained, very clean and offers great privacy. The location is a dream, with an amazing view over the natural park. We stayed there in the second half of October, and the pool heating was very well worth it and allowed us to enjoy the water for hours. What a great view of the natural park! une super maison de vacances ! We were 8 friends staying at this nice plays for a week. The landlord Mr Snow is a pearl!